ARLEE — Located 4 miles northwest of Arlee, the South Valley Creek Bridge was believed to be more than 100 years old. After a century of carrying school busses, logging trucks, emergency vehicles and farm equipment, the steel structure was beginning to show its age. “It was a really old, worn-out bridge and it was time to be replaced,” said project manager Mike Brown. 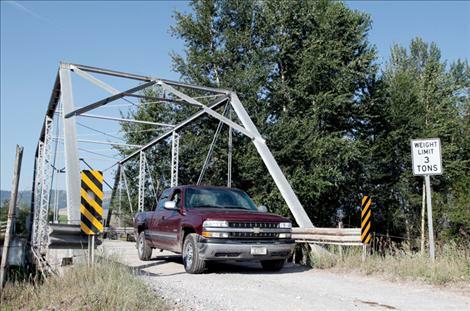 On July 16, Frontier West LLC removed the old bridge and began a three-to-four month project in cooperation with Lake County and the Confederated Salish and Kootenai Tribes to install a bigger, longer, safer structure. CSKT communications director Rob McDonald said the project has roots dating back to 2007. “(That year,) they did an inspection of tribal roads and found the bridge is not in good shape and may need replacing. We did our due diligence and discovered it was a county bridge,” McDonald said. Last year, the program allocated nearly $18.5 million to tribes in the Rocky Mountain Region alone. “We tossed our hat in the ring, and the BIA roads program thought that this bridge was deemed urgent enough to be funded,” McDonald said. S and K Environmental president Kevin Thomas said once the bridge was removed by Frontier West, S and K Environmental began reshaping the road to accommodate the new angle and make it more friendly for both the river and the people using it. The gross vehicle weight of the old bridge fluctuated between 3 and 8 tons in years past. The new bridge will have a GVW of 40 tons. “What this really does is it improves the access for the public, but it also improves access for emergency vehicles and firefighting equipment,” Trusler said. Frontier West vice president Mike Murphy said while the company has until the end of November to complete the project, he hopes to finish a month ahead of schedule. Even so, not all Arlee area residents were pleased with the project. This spring, some South Valley Creek residents filed an injunction against Lake County to halt the demolition. Court documents show the plaintiffs’ grievance against Lake County largely stems from the belief that Lake County exaggerated the dangerous state of the bridge in order to obtain funding. Plaintiffs filed an unopposed motion to withdraw their injunctive complaint Monday on the grounds that the bridge is already destroyed.